By far one of the oddest things we came across at Long Beach Comic Con was the world of Cy the Elephart. (Look, people, we don’t make this stuff up — We’d be a whole lot richer if we could!) 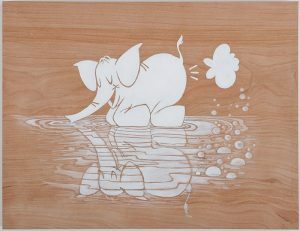 Created by a trio of “phartists” (their term), Denise Saffren, Paul Schoepflin, and Becky Mann have brought us a friendly and fun-loving elephant who loves nothing more than to break wind. And, apparently, to do so in some very prettily-painted environments. We’re not saying it’ll make more sense, but you’ll see just how busy these folks have been with this project when you visit the official Cy web site. And yes, they have a book project in the works and lots of Cy goodies for sale. Once again, discoveries from the Long Beach Comic Con: A new weekly on-line comic. “Tales of Absurdity is the product of the strange and absurd thoughts of cartoonist Alex Hoffman. Topics range from pop culture parody to the bizarre limits of the human imagination. Sometimes they are funny.” And quite often they involve animals, funny and otherwise. Recently, Mr. Hoffman has released the first collection of Absurdity comics in a new trade paperback, The Dawn of Absurdity. “Watch the absurdity evolve over 100 strips with all the twists and turns, parodies and puns.” All of this and more can be found (and purchased) at Mr. Hoffman’s official Tales of Absurdity web site. Coming To Rock Your World… Literally! Here’s another find from the Long Beach Comic Con.”Adorkable” is how the artist Jeff Victor describes much of his own work, and indeed his cartoon creations tend toward the “chibi” side of things. 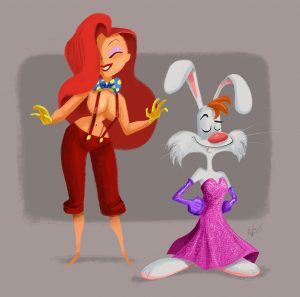 A veteran of Warner Brothers TV Animation and Nickelodeon Games, Jeff now works as a freelance illustrator — and a quick glance at his web site will show you what he’s been up to lately. Cartoon characters and yes, funny animals abound. 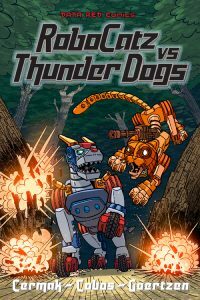 RoboCatz vs. ThunderDogs. That’s an almost self-explanatory title, isn’t it? Certainly gets the furry fan’s attention! It’s a new independent full-color comic book series created by Justin Cermak, Donovan Goertzen, and Fabian Cobos. 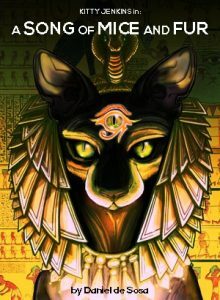 The premise is simple: Cats and dogs have been fighting for millennia, in front of humans and behind their backs. What humans don’t know is that both sides have employed war technology in their battles for some time — and in the not too distant future, both cats and dogs will have developed large anime-style robot fighters to carry out their planned destruction of the other side. Hmm… this maybe makes the whole comic sound a lot more serious than it is. Check out the much more detailed preview at Indie Comics Review. Allen Carter is a writer and comic artist from Hawaii, currently living in Southern California. Among his creations: After finding inspiration from Chuck Jones’ 1975 animated version of Rikki Tikki Tavi, Allen brought us the Figure of Speech Mongoose, who illustrates various well-known sayings (and awful puns) in particularly silly ways. 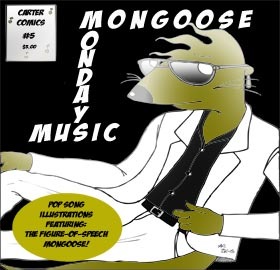 (“Catching a bus” — with a fishing line…) After experimenting with animation, Allen turned the FOS Mongoose into an on-line single-panel comic. Later he collected those works in a series of one-shot comic books, which he sells from his web site along with prints and other works. Allen is another artist making the circuit of Southern California comic cons. Look for him. 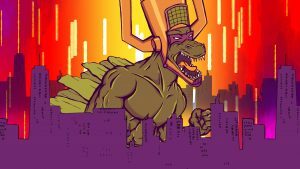 Decalzilla is an art project and on-line store created in 2010 by two artists named Jon and Courtney. No prizes for guessing: They create custom hand-made vinyl decals in a variety of designs and colors. Comic book stuff, anime, and yes lots of cartoons (including cartoon animals!) find there way into the works you find at Decalzilla.com. All of them original designs, mind you, not just copies of official artwork. Based out of Southern California, they travel to anime and comic conventions all around — and they’re hoping to expand their circle into other parts of the country and even internationally as well. 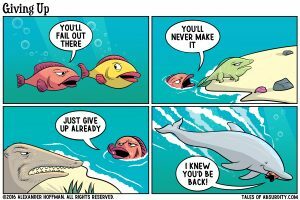 How Does An Elephant Sneak? Out-of-nowhere department… and more of a curiosity than a recommendation. 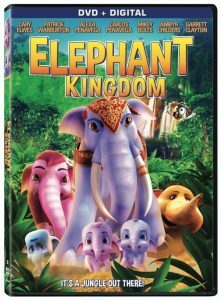 There’s a new DVD out this week: A direct-to-video animated film called Elephant Kingdom. Here’s the tag: “When brave elephant Rock (Cary Elwes) sees his wife, Melody (Alexa PenaVega), kidnapped by the powerful human king (Patrick Warburton), the mighty warrior will need some jumbo-sized help from his friends in order to rescue her. Coming to his aid is a quirky, courageous troop of young elephants, including Rally (Carlos PenaVega), and Pugsley (Mikey Bolts), plus the ever-trusty and wacky Wingman (Garrett Clayton) and the kindhearted human queen (Ambyr Childers)”. Interestingly, other than “Grindstone Entertainment” and Lionsgate (who released it) we know next to nothing about who made this. The IMDB entry does not list any director, writers, or other crew; only the English-language voice actors. It’s available and on the shelves now, but check out the trailer first.